Adani Ports and Special Economic Zone (APSEZ) is one of India's leading infrastructure conglomerate. The Adani Group - is India's largest private multi-port operator. APSEZ today is the only private sector port operator with presence across six ports in India. The company's aim is mainly to increase annual cargo handling capacity from 91 million MT in 2013 to 200 million MT by 2020. APSEZ's Mundra Port is Adani Group's crown jewel and the largest port in India. It also operates Asia's largest coal import terminal of 60 MMTPA. Adani Petronet Port Pvt. Ltd is a joint venture between Adani and Petronet Liquefied Natural Gas Ltd. at Dahej, South Gujarat. It has a capacity to handle 20 million tonnes of coal a year. Dahej Port is the one which handles varied commodities such as coal, silica sand, rock phosphate, steel products and project cargo and machinery items. The coal import terminal at Dahej is equipped with two jetties with a deep draft of 14metres each, thus enabling berthing of large capsize vessels. The railway line of about 62 km was built by the Bharuch Dahej Railway Corporation Limited, to provide vital rail connectivity to the industrial establishments in Dahej and is expected to feed several large industrial customers and power plants in Gujarat, Maharashtra and Western Madhya Pradesh. Adani is also developing ports at Hazira, Mormugao and Kandla on the west coast and Visakhapatnam on the east coast. The Adani Hazira Port Pvt Ltd is being developed in Hazira district, Surat to handle non-LNG facilities like containers, liquid, dry & break bulk. 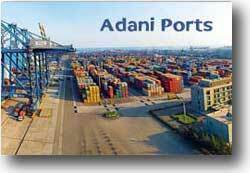 The Adani Mormugao Port terminal Pvt Ltd is being developed in Mormugao, Goa for coal import. The Adani Vizag Coal Terminal Pvt Ltd in Visakhapatnam is also under construction. APSEZ has signed a pact to develop bulk terminal at Kandla Port. It will be one of the largest terminals on the west coast of India, having a capacity to handle 20 million tonnes of cargo. The dry bulk terminal will be located off Tekra near Tuna outside Kandla Creek at the Kandla Port, India's number one port by volumes. The terminal will handle cargo like coal, fertilizer, salt, minerals and other agri-products. Apart from the developing and handling of ports, Adani focuses on the development of infrastructure for supporting the industrial development within the SEZ. Adani Logistics Ltd., today has remarkable performance on the development of strategic infrastructure and connectivity between Mundra & National Capital Region. Through its Australian subsidiary, Adani owns the 50 MMTPA capacity Abbot Point Coal Terminal in Queensland, Australia. It is a fast turnaround port facility for exporting coal. The port is well equipped with most of the extensive and efficient coal handling facilities both onshore and offshore. 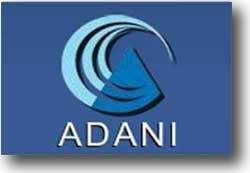 Adani Abbot Point Terminal Pty Ltd is also the Australian subsidiary of Adani Ports and Special Economic Zone Ltd, which developed and manages the largest privately developed port in India and forms part of the Adani Group. Under the Port's lease, the State retains ownership of the Port land and infrastructure such as the jetty and the wharf. The North Queensland Bulk Ports Corporation remains as the port authority for Adani Abbot Point Terminal and is responsible for the ongoing safety, security, efficiency of and master planning for the Port. Courage: the organization shall embrace new ideas and businesses. Trust: the organisation shall believe in the employees and other stakeholders. To be the globally admired leader in integrated Infrastructure with a deep commitment to nation building. To be known for their scale of ambition, speed of execution and quality of operation. APSEZ is connected with the Indian Railway network by a privately developed 64-km rail line. The private rail line has been developed by APSEZ and connects the port to the nearest Indian Railways railhead at Adipur. The single line has a capacity to handle the movement of 45 trains to and / or from APSEZ. APSEZ has done the double-lining of Adipur-Mundra route as well. The expansion shall augment APSEZ's line capacity which is between Mundra and Adipur to 130 trains per day. APSEZ is connected to the northern and western states and NCR through the Palanpur route and rest of the hinterland by the Ahmedabad route. The rail infrastructure has the capability to handle double stack container trains till Kishangarh, Rajansthan. "Special Commendation Certificate for Golden Peacock Award" which is in the field of Occupational, Health & Safety - 2011. Won awards at the 22nd Gujarat Level Convention on Quality held at Vadodara in September 2011 and 25th National Convention on Quality Concepts (NCQC) - 2011 held at Hyderabad. Adani Ports & Special Economic Zone Limited (APSEZL) is highly committed to promoting a positive environmental culture seeking continuous improvement in the environmental performance of the organization. The company emphasizes on mostly implementing integrated environmental management system to optimize its resource consumption and waste reductions. The environmental concerns are being considered and addressed adequately during planning, development and daily operations. The management is proactively working on strategic and also the assessments and operational decisions to strengthen environmental monitoring and reporting as well as decide and device various programmes and policies for continual improvement in environmental benchmarking. The Company's effort is also to improve energy efficiency and reduce emissions by introducing and implementing environmental friendly technologies in various operations thereby supporting India's National Action Plan for Climate Change as well as contributing to the global movement of Climate Change. The company is fully aware of impacts on environment due to development activities and is also putting its best efforts to maintain balance between ecology and development. As a responsible corporate entity the company is also promoting various programmes and projects based on the need and the assessment of the surrounding areas of the development. The company's main goal is to achieve sustainable development by making conscious efforts to bring equality in Environment protection, Economic Growth and Social upliftment. The Company invests 3% of the group profit in community initiatives through the Adani Foundation. 3 Sustainable Livelihood Development - Holding hands of most of the marginalized groups to improve livelihood opportunities and thus improve the quality of life at the local community level. 4 Rural Infrastructure Developments - Needs mostly the basic quality infrastructure for better inclusive growth. Enabling India to meet its energy needs while minimising the impact on the environment is a big challenge. The foundation protects biodiversity in ecologically sensitive areas like Mundra, where it has conserved and extended the mangrove forests. The organisation was the first power company in India to use 'supercritical' technology to reduce CO2 emissions, an initiative that won them the Clean Development Certification from the United Nations Framework Convention on Climate Change (UNFCCC). They are also at the forefront of initiatives to improve efficiency and reduce waste.